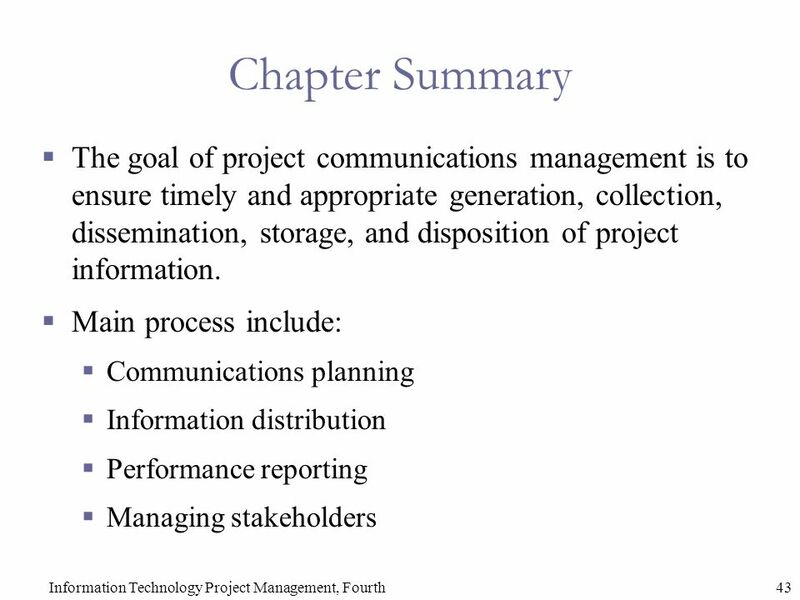 Chapter 10: Project Communications Management Information Technology Project Management, Fourth Edition. 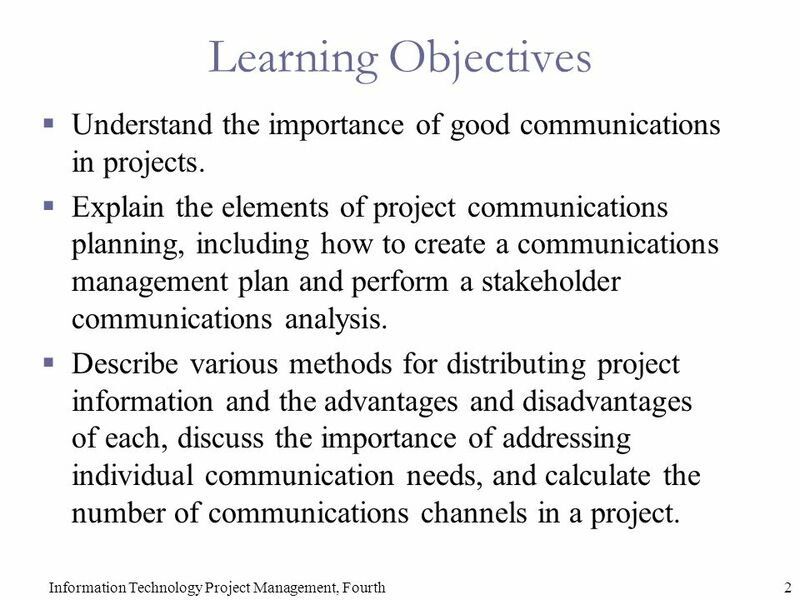 2 2Information Technology Project Management, Fourth Learning Objectives  Understand the importance of good communications in projects. 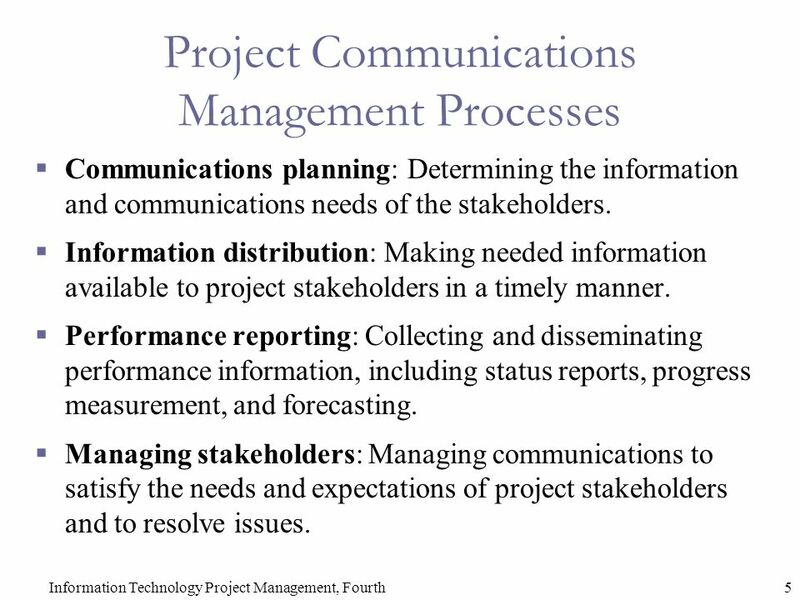  Explain the elements of project communications planning, including how to create a communications management plan and perform a stakeholder communications analysis. 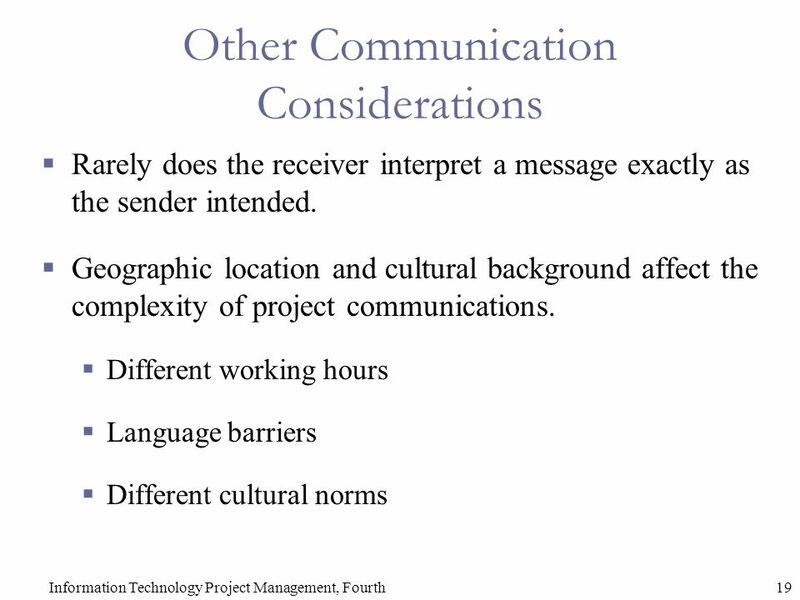  Describe various methods for distributing project information and the advantages and disadvantages of each, discuss the importance of addressing individual communication needs, and calculate the number of communications channels in a project. 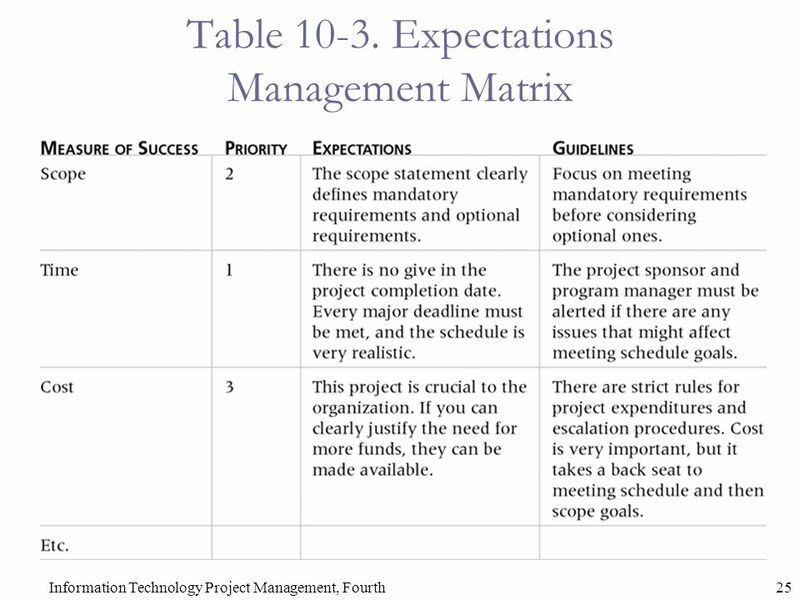 3 3Information Technology Project Management, Fourth Learning Objectives (cont’d)  Understand how the main outputs of performance reporting help stakeholders stay informed about project resources.  Recognize the importance of good communications management for stakeholder relationships and for resolving issues. 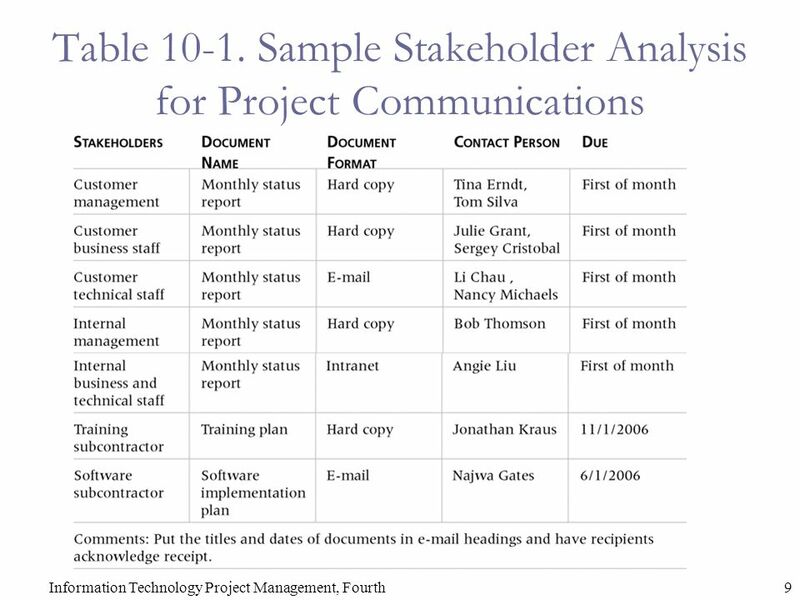  List various methods for improving project communications, such as managing conflicts, running effective meetings, using e-mail and other technologies effectively, and using templates.  Describe how software can enhance project communications management. 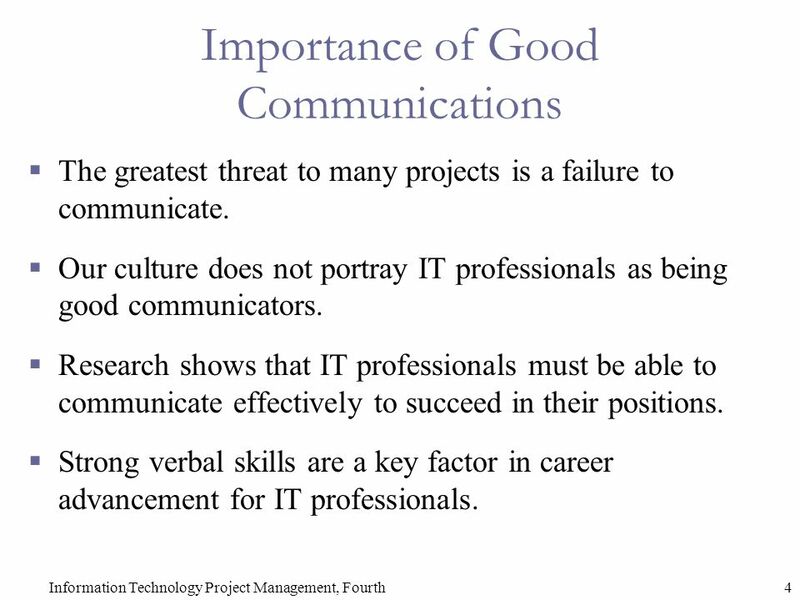 4 4Information Technology Project Management, Fourth Importance of Good Communications  The greatest threat to many projects is a failure to communicate. 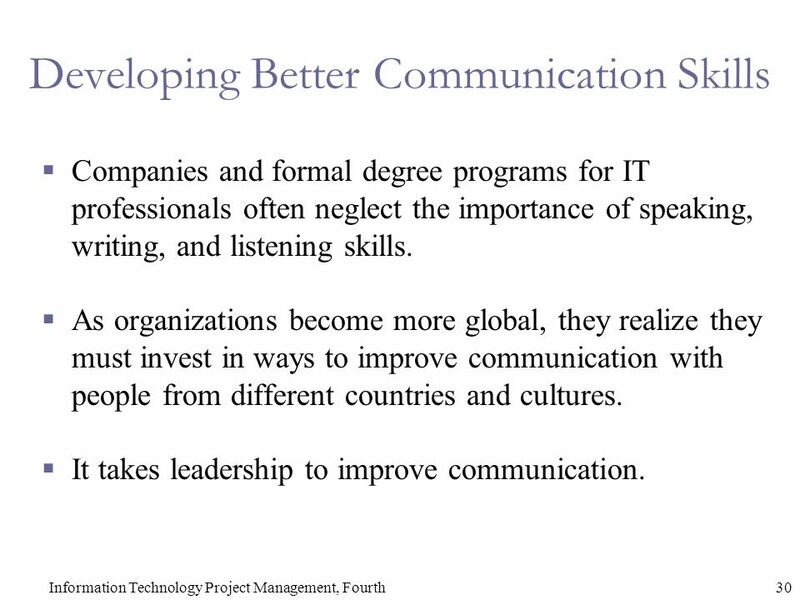  Our culture does not portray IT professionals as being good communicators.  Research shows that IT professionals must be able to communicate effectively to succeed in their positions.  Strong verbal skills are a key factor in career advancement for IT professionals. 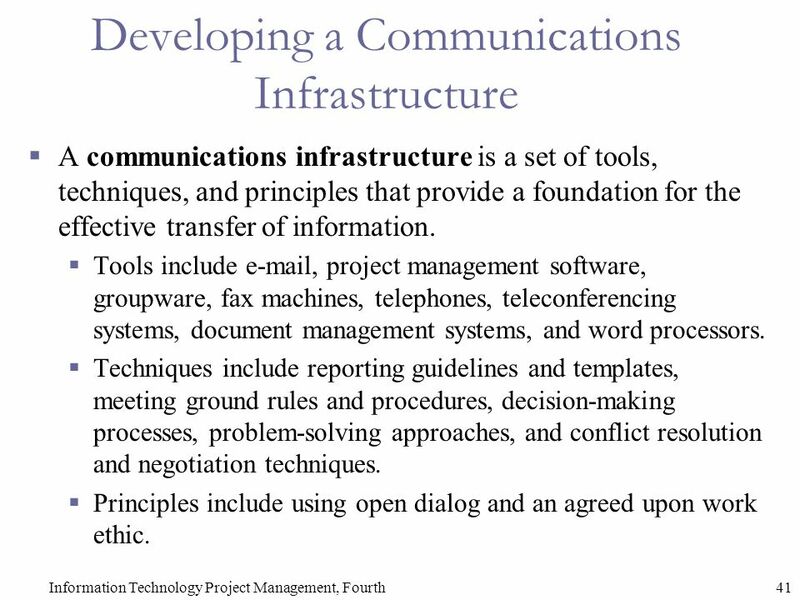 5 5Information Technology Project Management, Fourth Project Communications Management Processes  Communications planning: Determining the information and communications needs of the stakeholders. 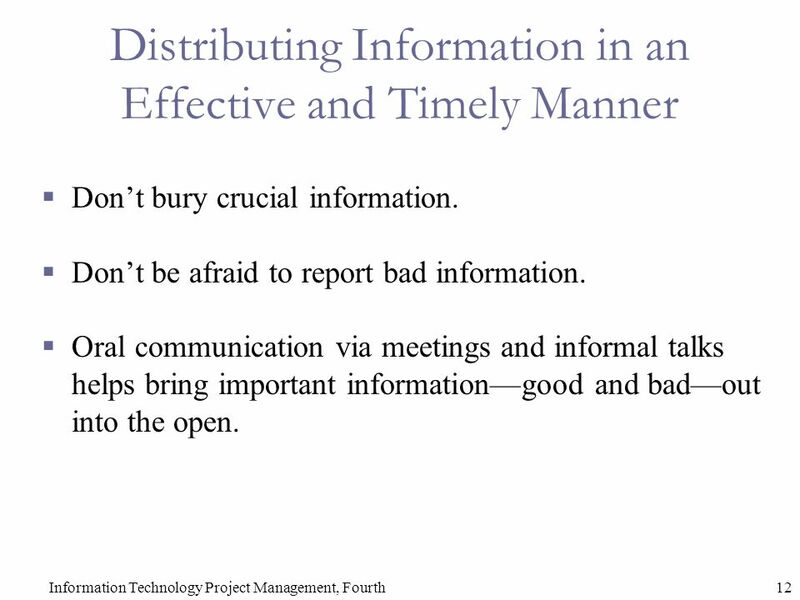  Information distribution: Making needed information available to project stakeholders in a timely manner. 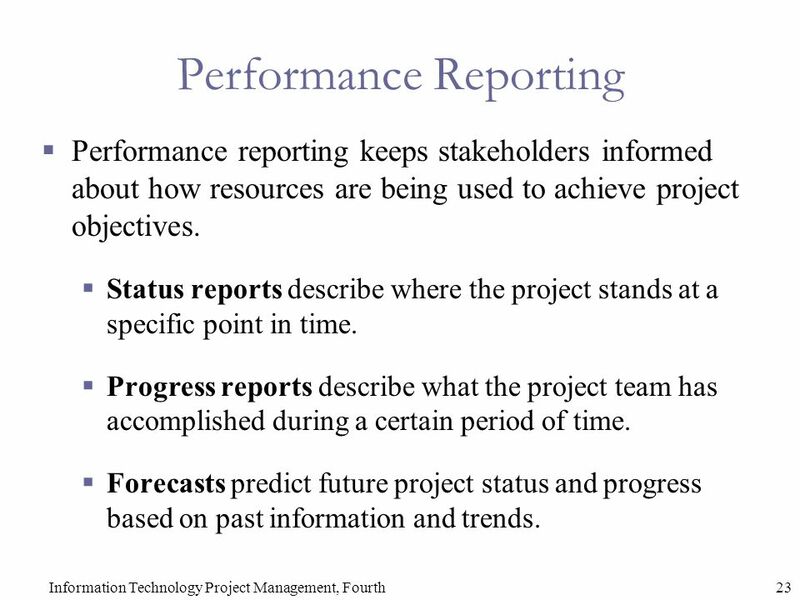  Performance reporting: Collecting and disseminating performance information, including status reports, progress measurement, and forecasting. 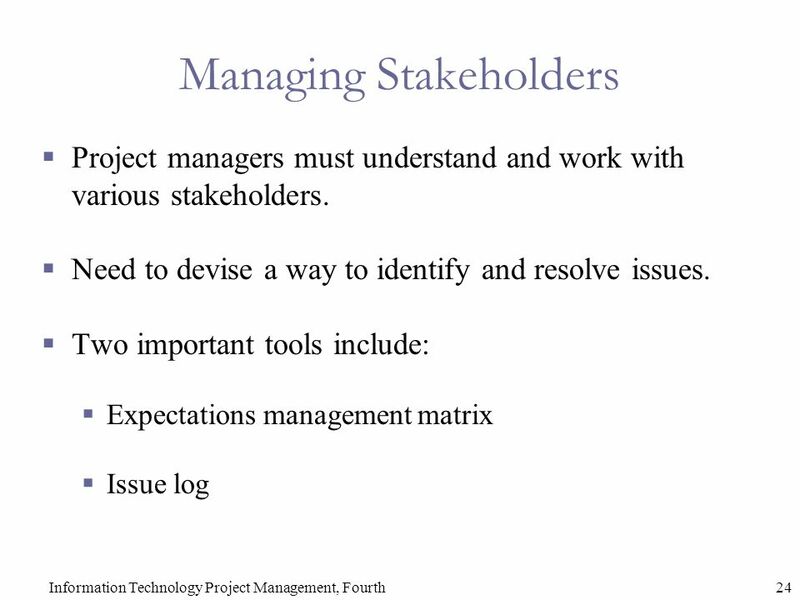  Managing stakeholders: Managing communications to satisfy the needs and expectations of project stakeholders and to resolve issues. 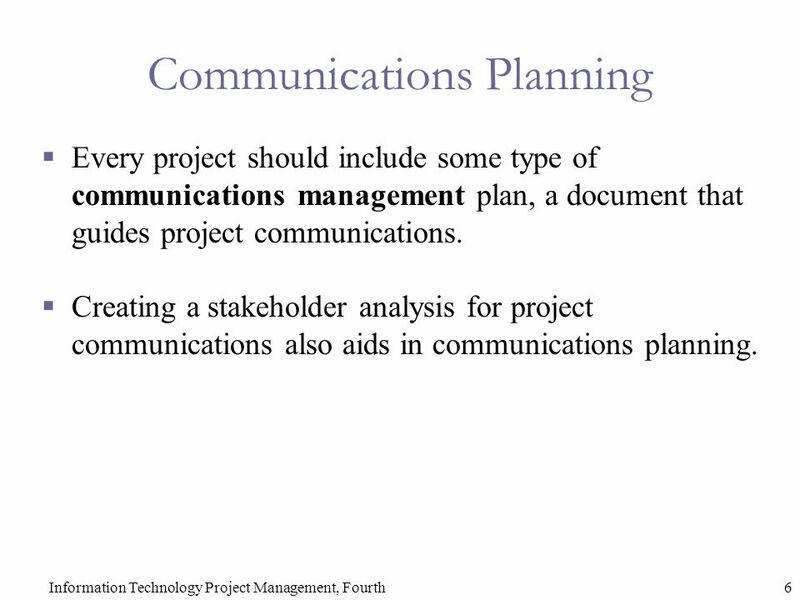 6 6Information Technology Project Management, Fourth Communications Planning  Every project should include some type of communications management plan, a document that guides project communications. 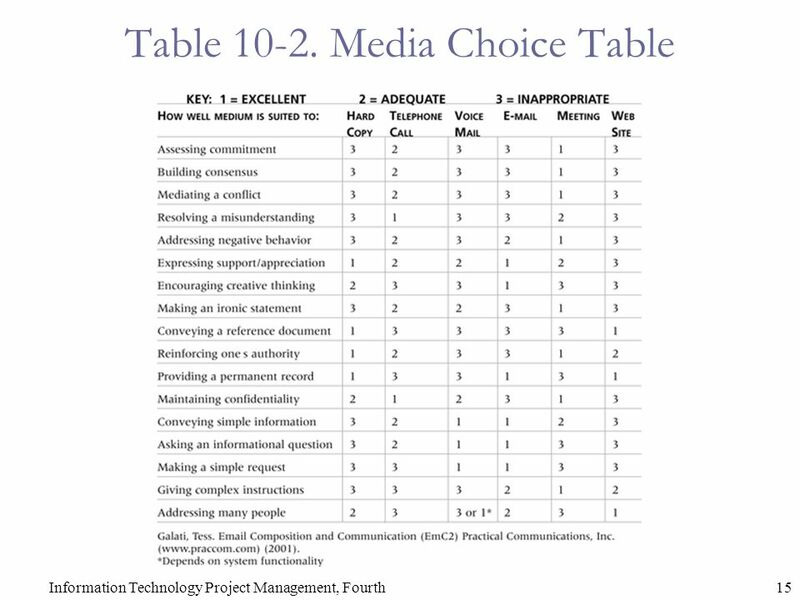  Creating a stakeholder analysis for project communications also aids in communications planning. 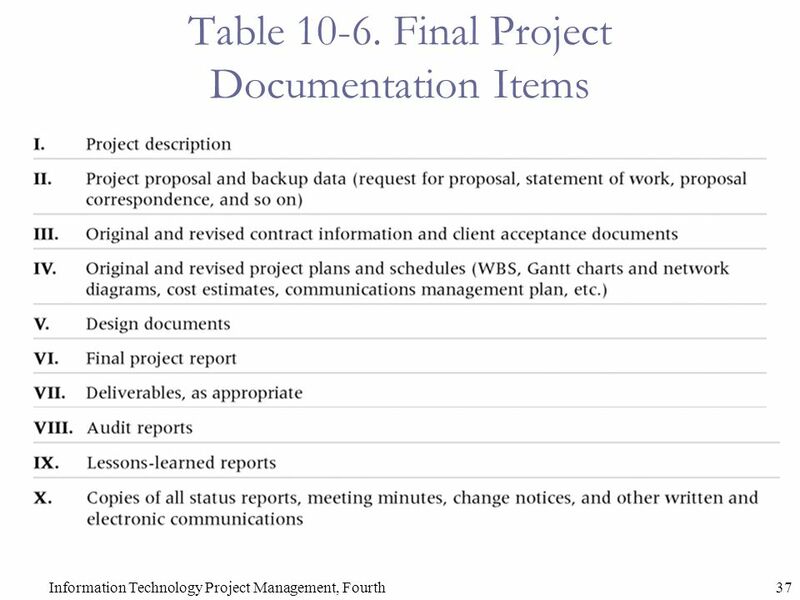 7 7Information Technology Project Management, Fourth Communications Management Plan Contents  Stakeholder communications requirements.  Information to be communicated, including format, content, and level of detail.  The people who will receive the information and who will produce it.  Suggested methods or technologies for conveying the information. 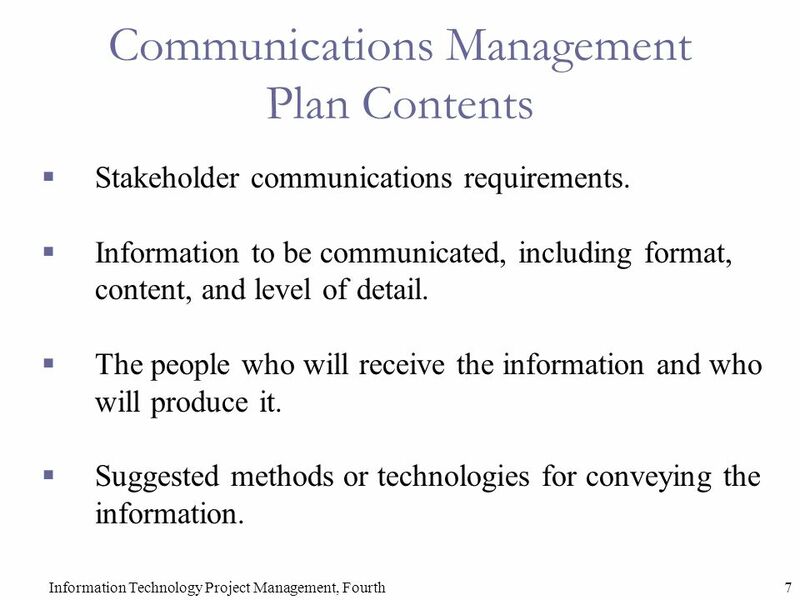 8 8Information Technology Project Management, Fourth Communications Management Plan Contents (cont’d)  Frequency of communication.  Escalation procedures for resolving issues. 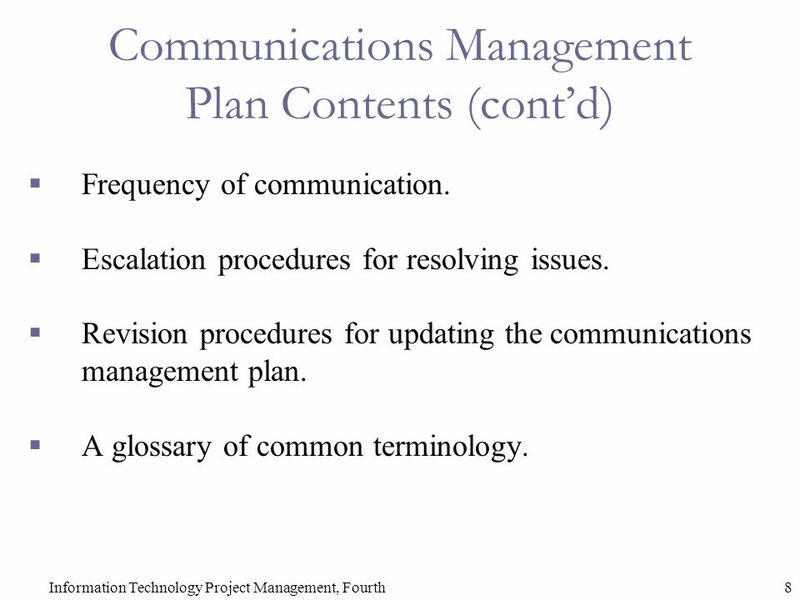  Revision procedures for updating the communications management plan.  A glossary of common terminology. 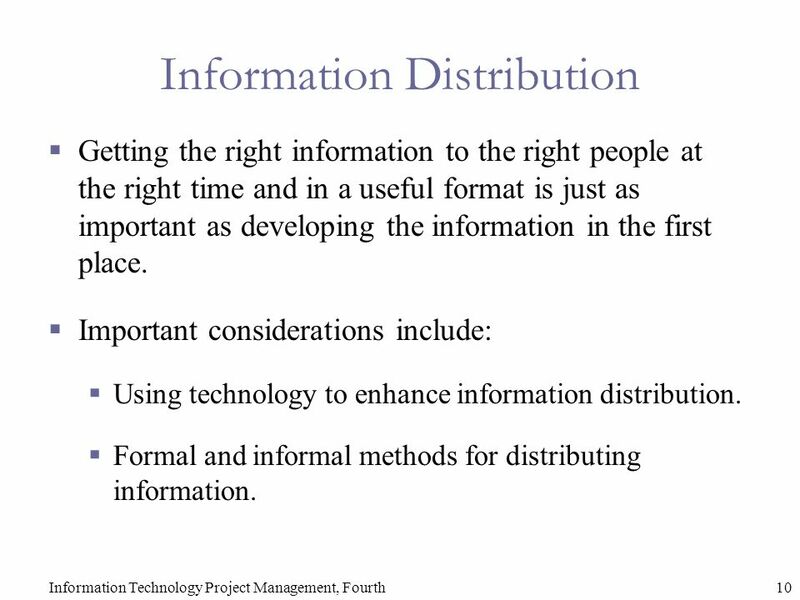 10 10Information Technology Project Management, Fourth Information Distribution  Getting the right information to the right people at the right time and in a useful format is just as important as developing the information in the first place.  Important considerations include:  Using technology to enhance information distribution.  Formal and informal methods for distributing information. 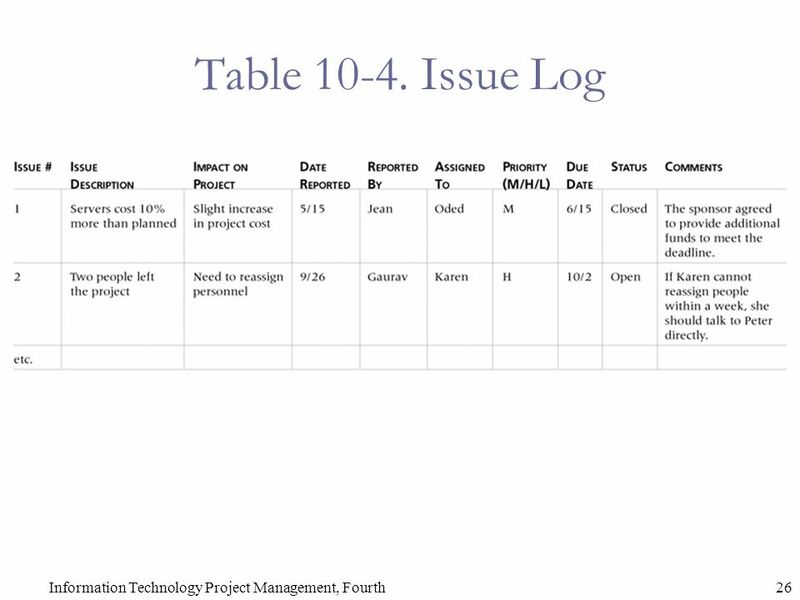 11 11Information Technology Project Management, Fourth What Went Wrong? A well-publicized example of misuse of e-mail comes from the 1998 Justice Department's high profile, antitrust suit against Microsoft. E- mail emerged as a star witness in the case. Many executives sent messages that should never have been put in writing. The court used e-mail as evidence, even though the senders of the notes said the information was being interpreted out of context. * See the example that describes the misunderstanding of the phrase “pedagogical approach” on page 392. 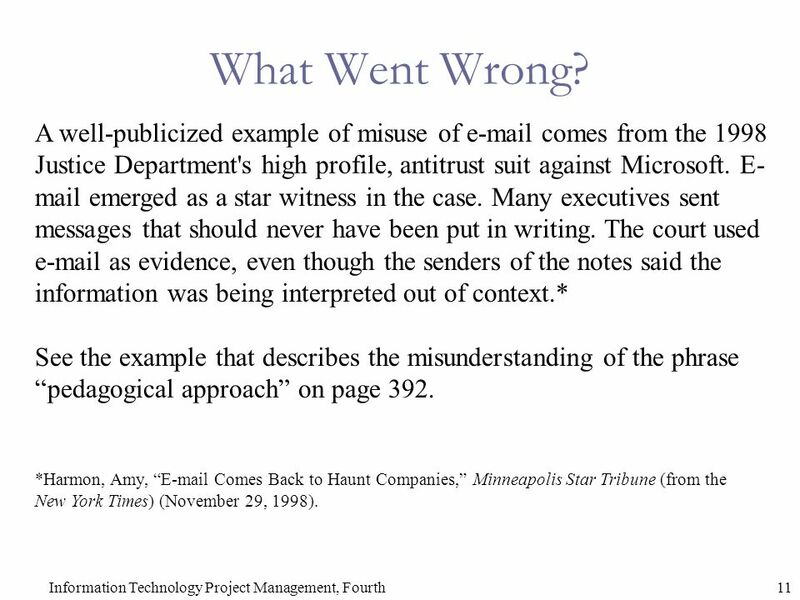 *Harmon, Amy, “E-mail Comes Back to Haunt Companies,” Minneapolis Star Tribune (from the New York Times) (November 29, 1998). 12 12Information Technology Project Management, Fourth Distributing Information in an Effective and Timely Manner  Don’t bury crucial information.  Don’t be afraid to report bad information.  Oral communication via meetings and informal talks helps bring important information—good and bad—out into the open. 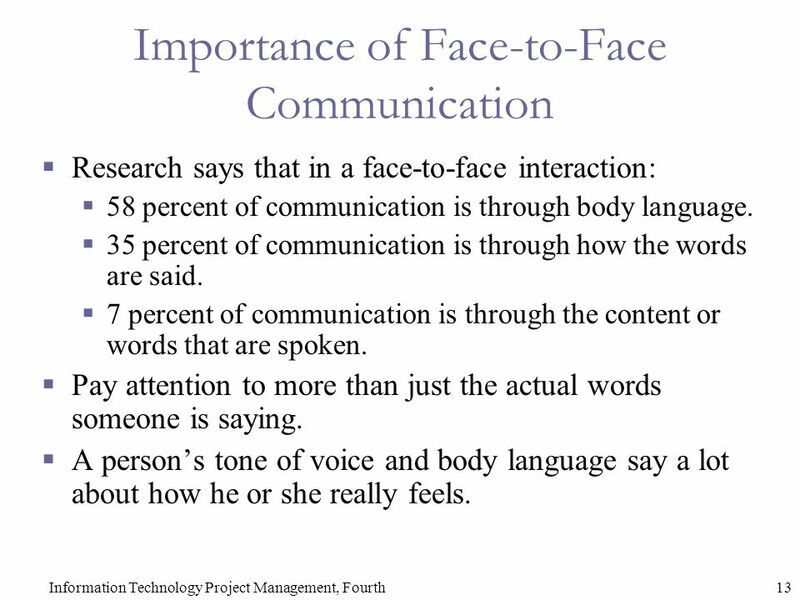 13 13Information Technology Project Management, Fourth Importance of Face-to-Face Communication  Research says that in a face-to-face interaction:  58 percent of communication is through body language.  35 percent of communication is through how the words are said.  7 percent of communication is through the content or words that are spoken.  Pay attention to more than just the actual words someone is saying.  A person’s tone of voice and body language say a lot about how he or she really feels. 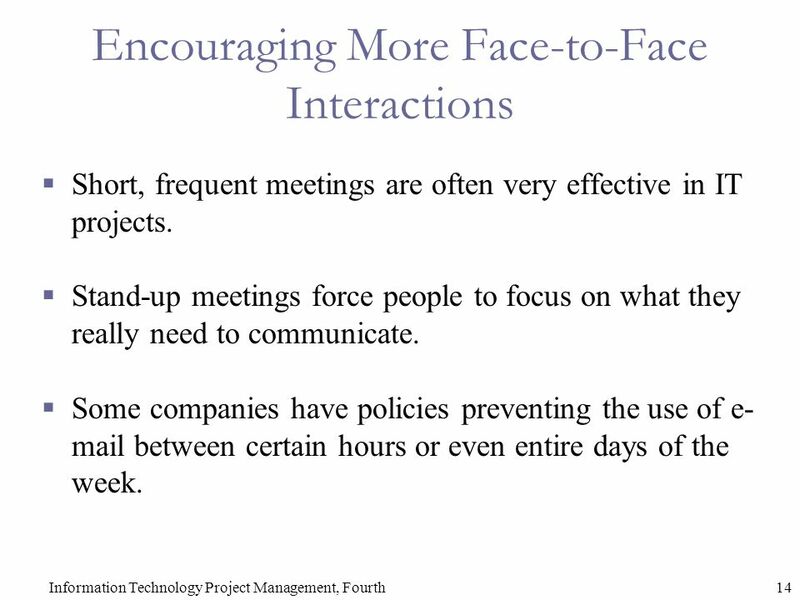 14 14Information Technology Project Management, Fourth Encouraging More Face-to-Face Interactions  Short, frequent meetings are often very effective in IT projects.  Stand-up meetings force people to focus on what they really need to communicate.  Some companies have policies preventing the use of e- mail between certain hours or even entire days of the week. 16 16Information Technology Project Management, Fourth Media Snapshot  Live video is a modern medium for sending information.  Microsoft says that one in every five face-to-face meetings can be replaced with Web conferencing tools, and they estimate it will save $70 million in reduced travel in one year alone. *  The medium can backfire, as in the case with the Janet Jackson wardrobe malfunction during the 2004 Super Bowl half-time show. 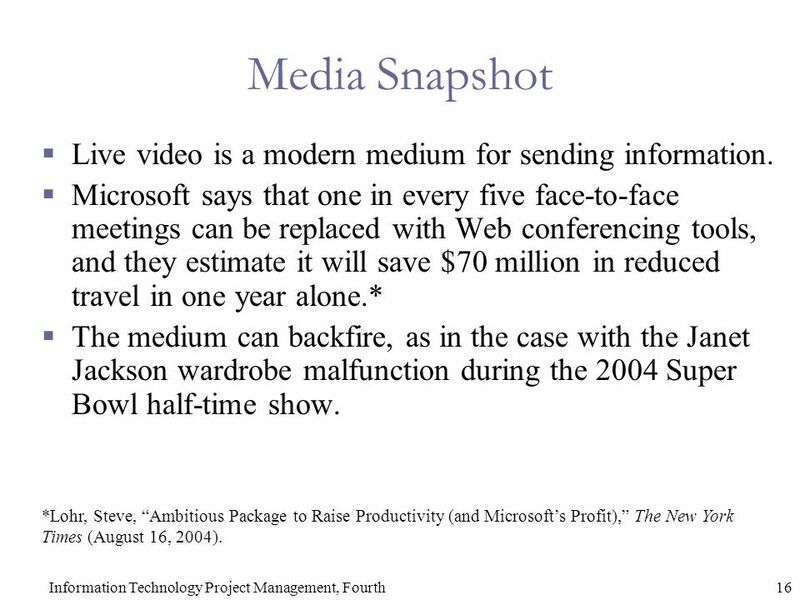 *Lohr, Steve, “Ambitious Package to Raise Productivity (and Microsoft’s Profit),” The New York Times (August 16, 2004). 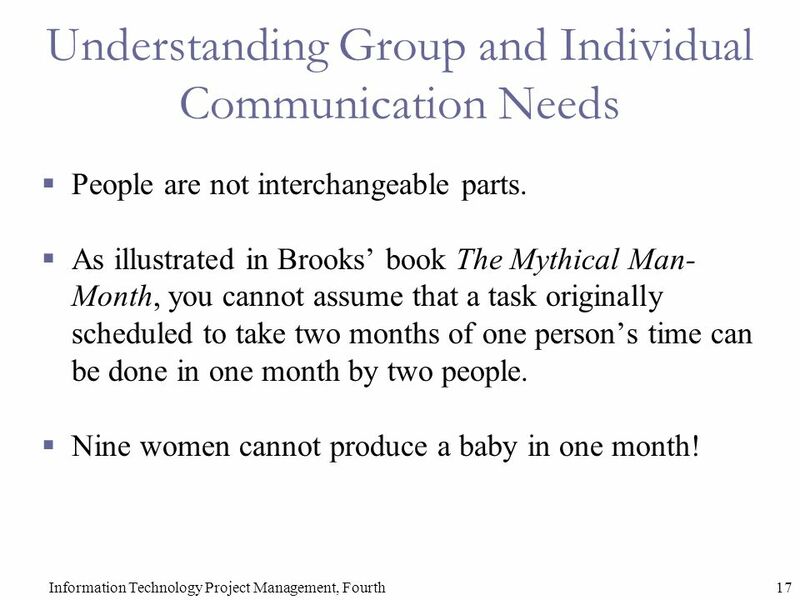 17 17Information Technology Project Management, Fourth Understanding Group and Individual Communication Needs  People are not interchangeable parts.  As illustrated in Brooks’ book The Mythical Man- Month, you cannot assume that a task originally scheduled to take two months of one person’s time can be done in one month by two people.  Nine women cannot produce a baby in one month! 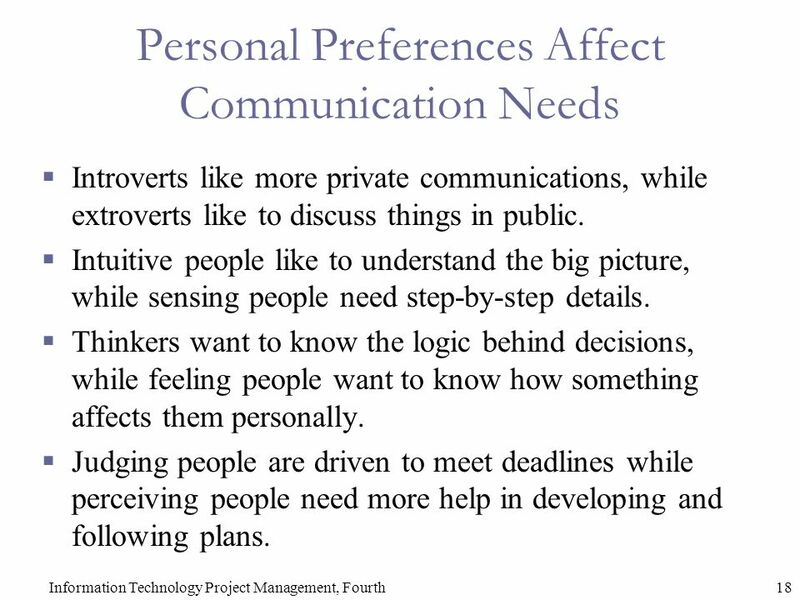 18 18Information Technology Project Management, Fourth Personal Preferences Affect Communication Needs  Introverts like more private communications, while extroverts like to discuss things in public.  Intuitive people like to understand the big picture, while sensing people need step-by-step details.  Thinkers want to know the logic behind decisions, while feeling people want to know how something affects them personally.  Judging people are driven to meet deadlines while perceiving people need more help in developing and following plans. 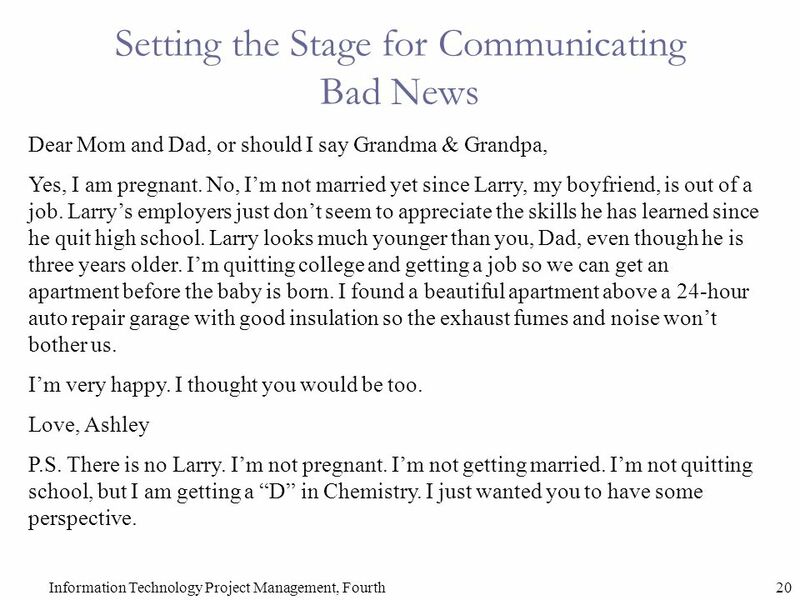 20 20Information Technology Project Management, Fourth Setting the Stage for Communicating Bad News Dear Mom and Dad, or should I say Grandma & Grandpa, Yes, I am pregnant. No, I’m not married yet since Larry, my boyfriend, is out of a job. Larry’s employers just don’t seem to appreciate the skills he has learned since he quit high school. Larry looks much younger than you, Dad, even though he is three years older. I’m quitting college and getting a job so we can get an apartment before the baby is born. I found a beautiful apartment above a 24-hour auto repair garage with good insulation so the exhaust fumes and noise won’t bother us. I’m very happy. I thought you would be too. Love, Ashley P.S. There is no Larry. I’m not pregnant. I’m not getting married. I’m not quitting school, but I am getting a “D” in Chemistry. I just wanted you to have some perspective. 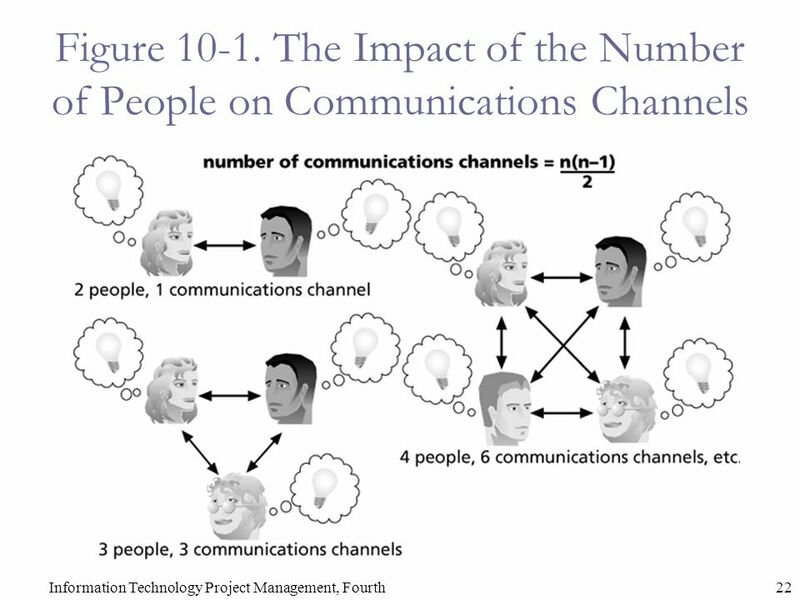 21 21Information Technology Project Management, Fourth Determining the Number of Communications Channels  As the number of people involved increases, the complexity of communications increases because there are more communications channels or pathways through which people can communicate. 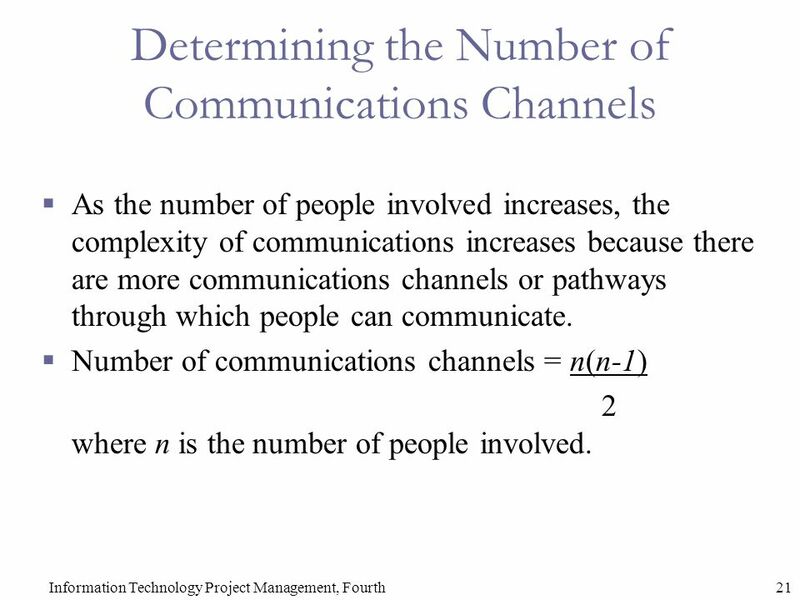  Number of communications channels = n(n-1) 2 where n is the number of people involved. 23 23Information Technology Project Management, Fourth Performance Reporting  Performance reporting keeps stakeholders informed about how resources are being used to achieve project objectives.  Status reports describe where the project stands at a specific point in time.  Progress reports describe what the project team has accomplished during a certain period of time.  Forecasts predict future project status and progress based on past information and trends. 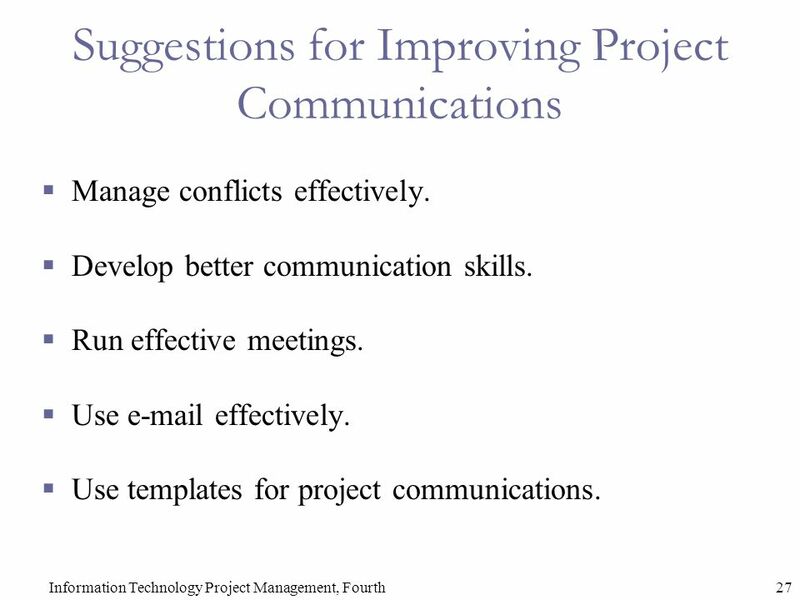 27 27Information Technology Project Management, Fourth Suggestions for Improving Project Communications  Manage conflicts effectively.  Develop better communication skills.  Run effective meetings.  Use e-mail effectively. 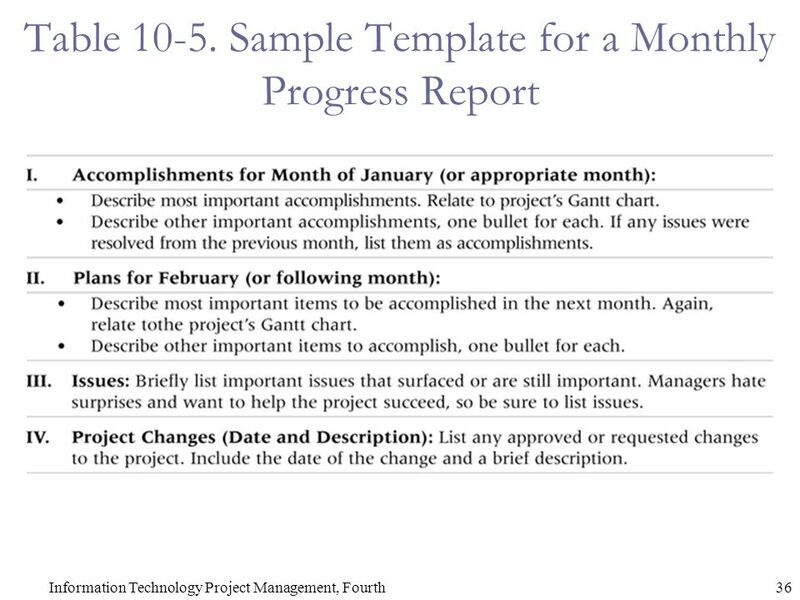  Use templates for project communications. 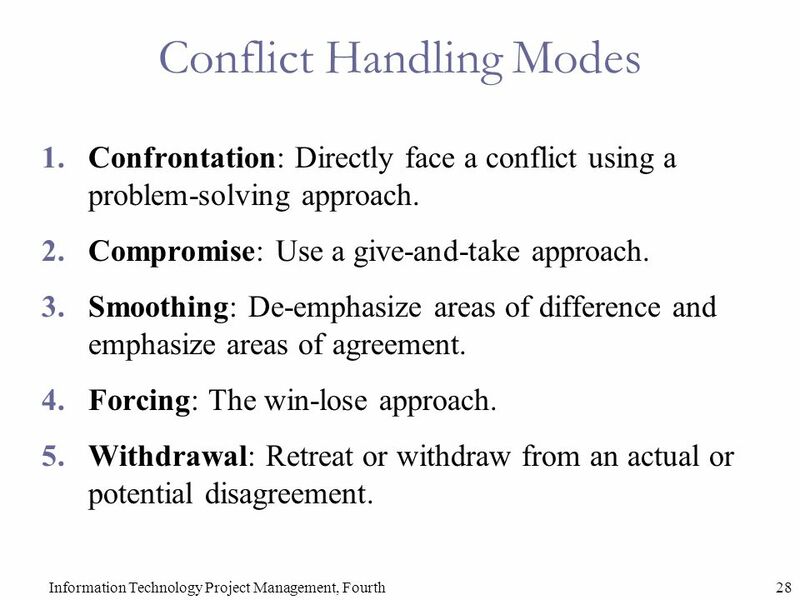 28 28Information Technology Project Management, Fourth Conflict Handling Modes 1.Confrontation: Directly face a conflict using a problem-solving approach. 2.Compromise: Use a give-and-take approach. 3.Smoothing: De-emphasize areas of difference and emphasize areas of agreement. 4.Forcing: The win-lose approach. 5.Withdrawal: Retreat or withdraw from an actual or potential disagreement. 29 29Information Technology Project Management, Fourth Conflict Can Be Good  Conflict often produces important results, such as new ideas, better alternatives, and motivation to work harder and more collaboratively.  Groupthink: Conformance to the values or ethical standards of a group. 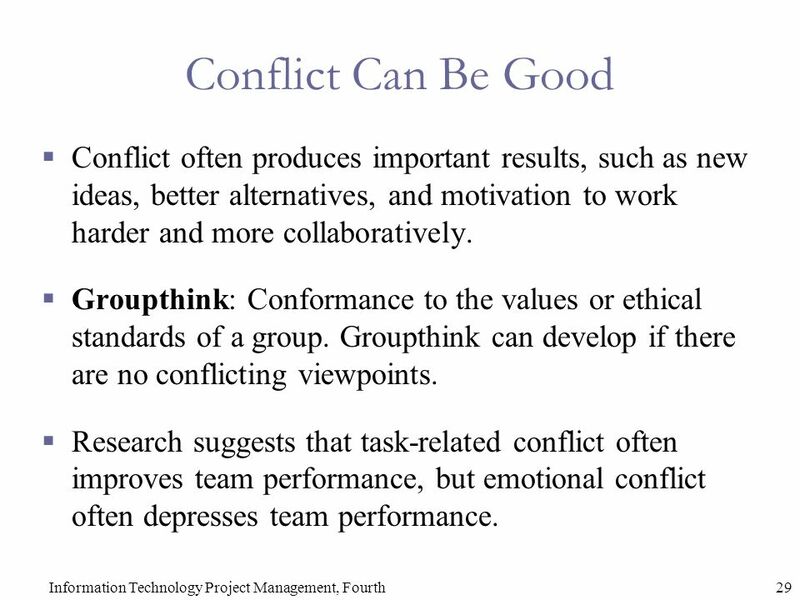 Groupthink can develop if there are no conflicting viewpoints.  Research suggests that task-related conflict often improves team performance, but emotional conflict often depresses team performance. 30 30Information Technology Project Management, Fourth Developing Better Communication Skills  Companies and formal degree programs for IT professionals often neglect the importance of speaking, writing, and listening skills.  As organizations become more global, they realize they must invest in ways to improve communication with people from different countries and cultures.  It takes leadership to improve communication. 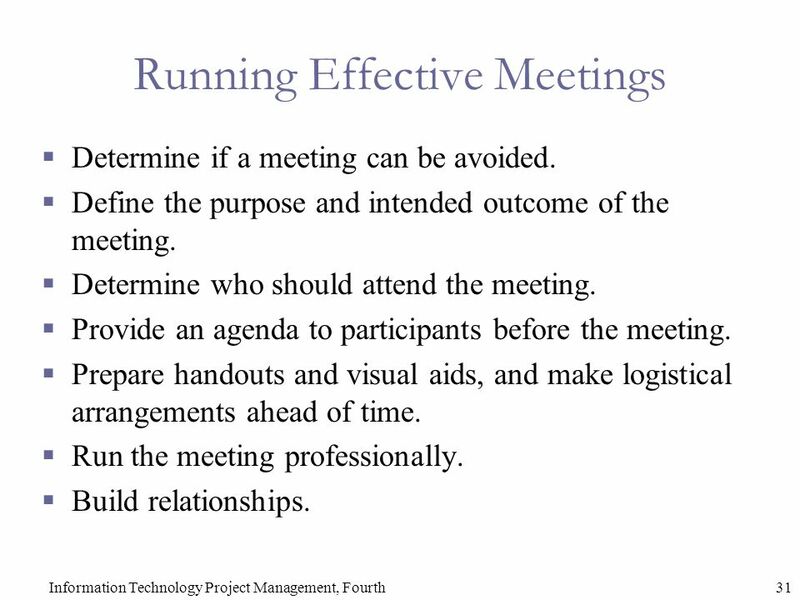 31 31Information Technology Project Management, Fourth Running Effective Meetings  Determine if a meeting can be avoided.  Define the purpose and intended outcome of the meeting.  Determine who should attend the meeting.  Provide an agenda to participants before the meeting.  Prepare handouts and visual aids, and make logistical arrangements ahead of time.  Run the meeting professionally.  Build relationships. 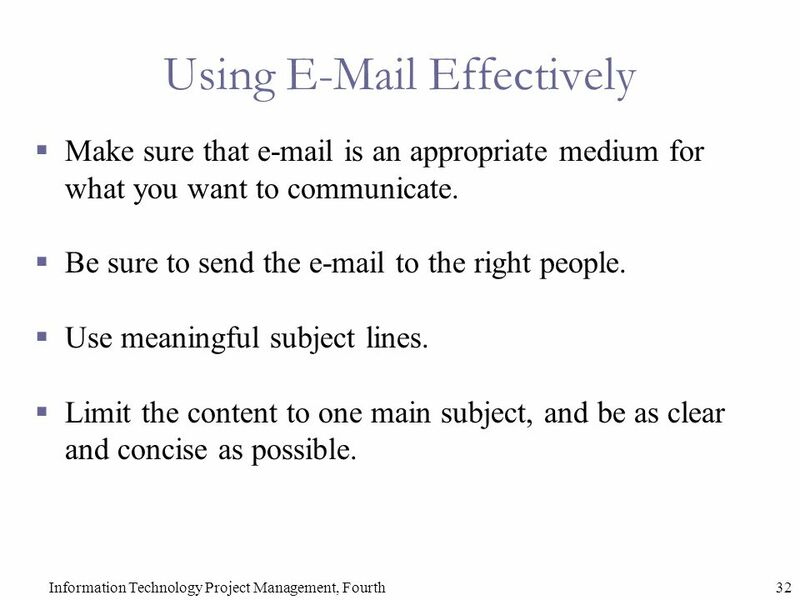 32 32Information Technology Project Management, Fourth Using E-Mail Effectively  Make sure that e-mail is an appropriate medium for what you want to communicate.  Be sure to send the e-mail to the right people.  Use meaningful subject lines.  Limit the content to one main subject, and be as clear and concise as possible. 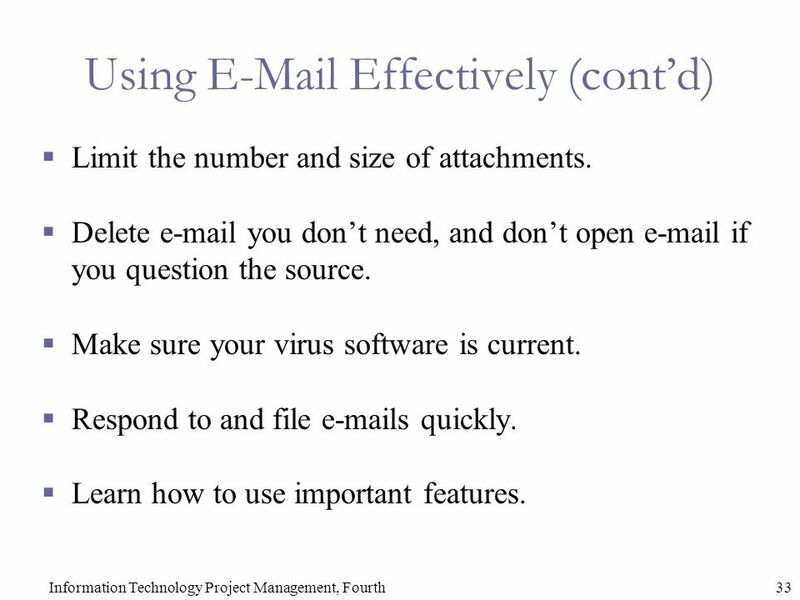 33 33Information Technology Project Management, Fourth Using E-Mail Effectively (cont’d)  Limit the number and size of attachments.  Delete e-mail you don’t need, and don’t open e-mail if you question the source.  Make sure your virus software is current.  Respond to and file e-mails quickly.  Learn how to use important features. 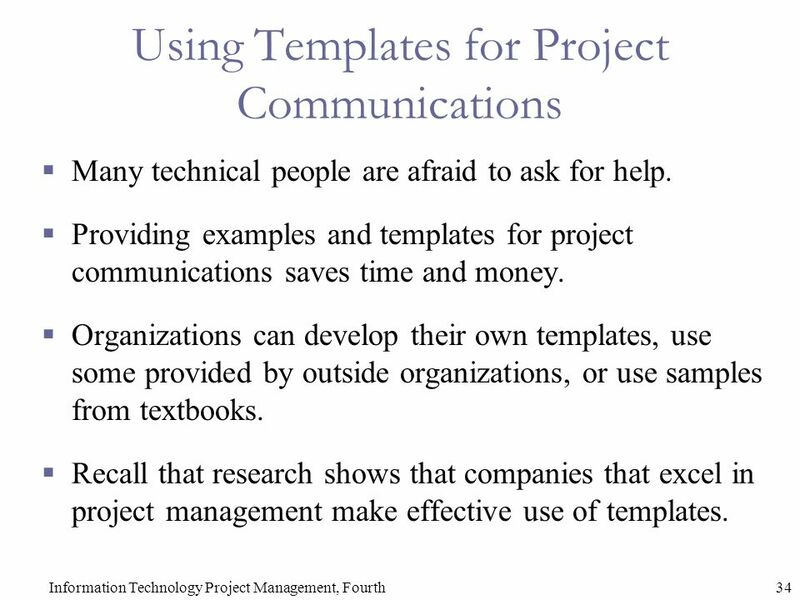 34 34Information Technology Project Management, Fourth Using Templates for Project Communications  Many technical people are afraid to ask for help. 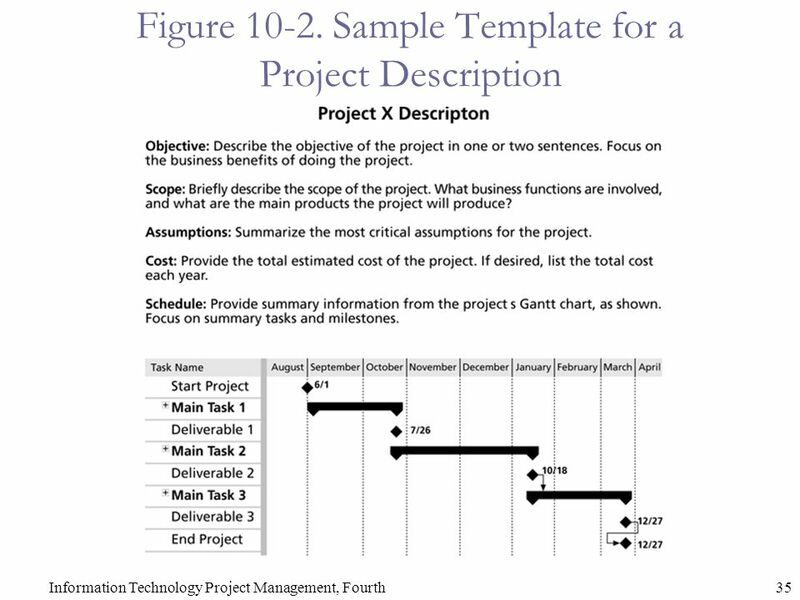  Providing examples and templates for project communications saves time and money.  Organizations can develop their own templates, use some provided by outside organizations, or use samples from textbooks. 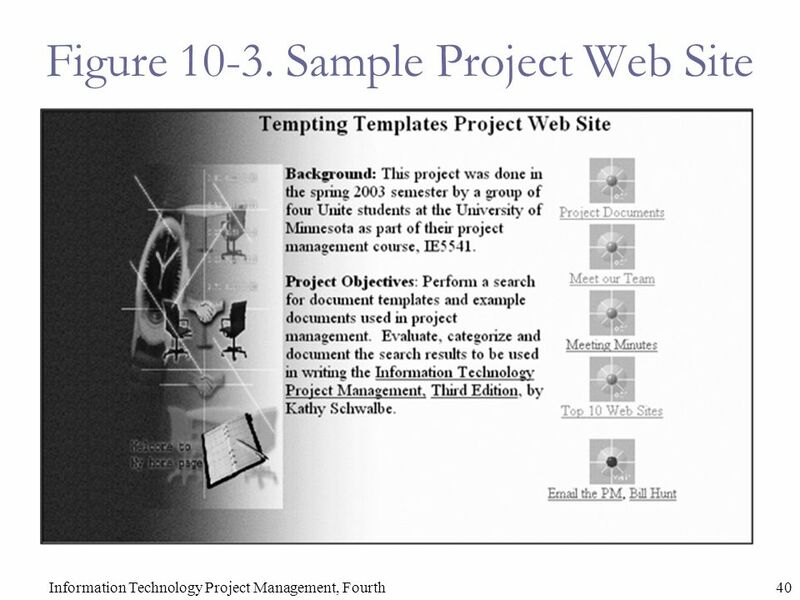  Recall that research shows that companies that excel in project management make effective use of templates. 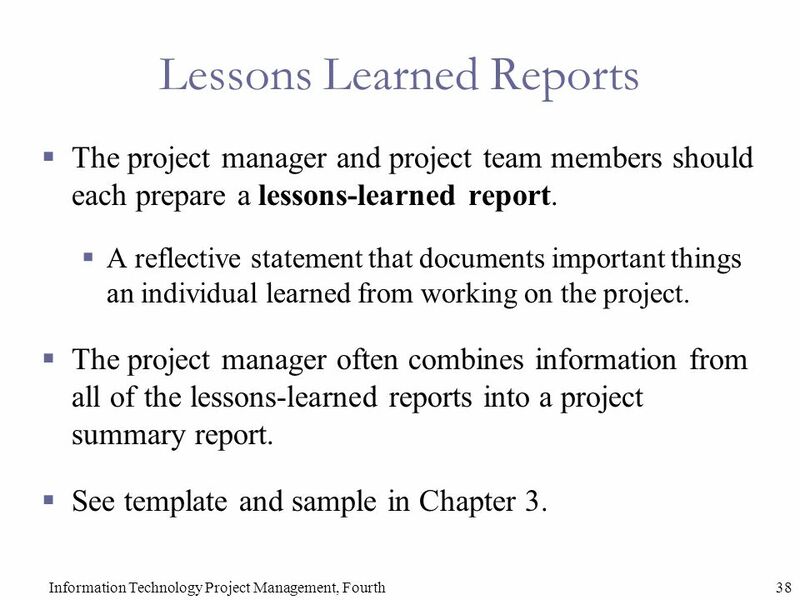 38 38Information Technology Project Management, Fourth Lessons Learned Reports  The project manager and project team members should each prepare a lessons-learned report.  A reflective statement that documents important things an individual learned from working on the project.  The project manager often combines information from all of the lessons-learned reports into a project summary report.  See template and sample in Chapter 3. 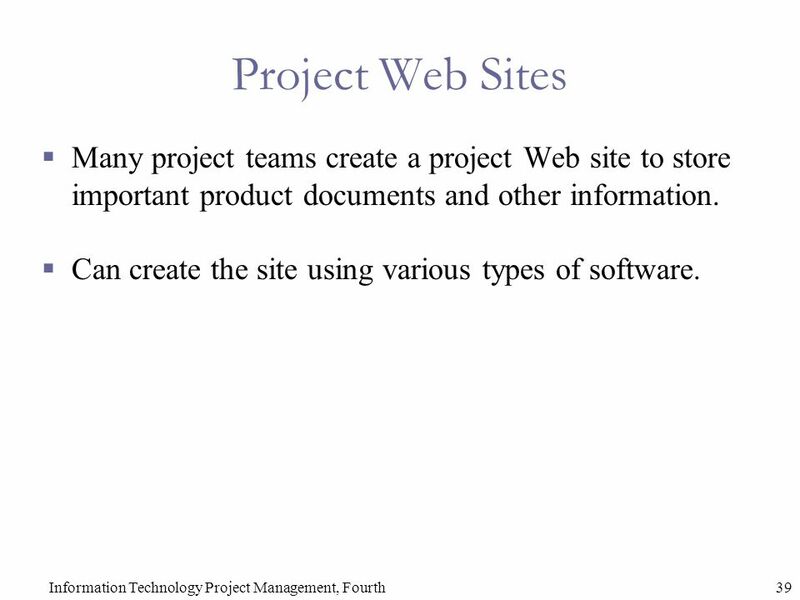 39 39Information Technology Project Management, Fourth Project Web Sites  Many project teams create a project Web site to store important product documents and other information.  Can create the site using various types of software. 41 41Information Technology Project Management, Fourth Developing a Communications Infrastructure  A communications infrastructure is a set of tools, techniques, and principles that provide a foundation for the effective transfer of information.  Tools include e-mail, project management software, groupware, fax machines, telephones, teleconferencing systems, document management systems, and word processors.  Techniques include reporting guidelines and templates, meeting ground rules and procedures, decision-making processes, problem-solving approaches, and conflict resolution and negotiation techniques.  Principles include using open dialog and an agreed upon work ethic. 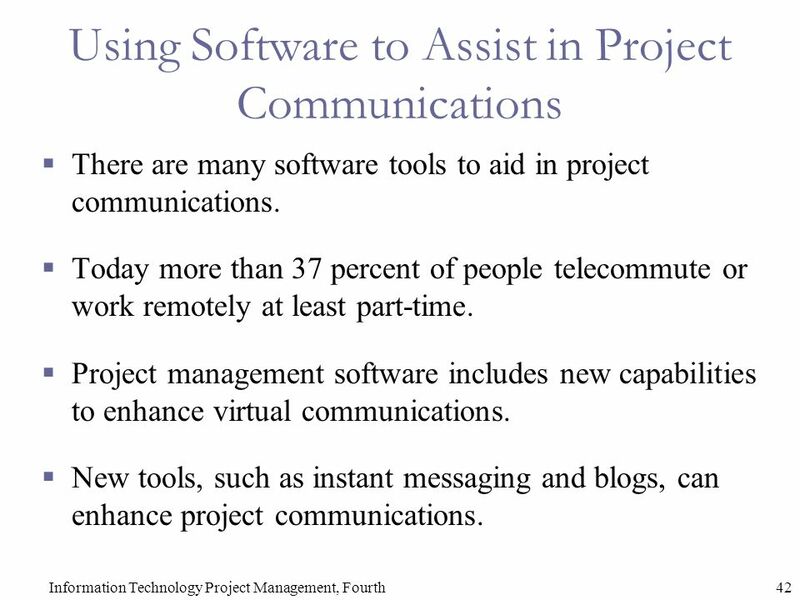 42 42Information Technology Project Management, Fourth Using Software to Assist in Project Communications  There are many software tools to aid in project communications.  Today more than 37 percent of people telecommute or work remotely at least part-time.  Project management software includes new capabilities to enhance virtual communications.  New tools, such as instant messaging and blogs, can enhance project communications. 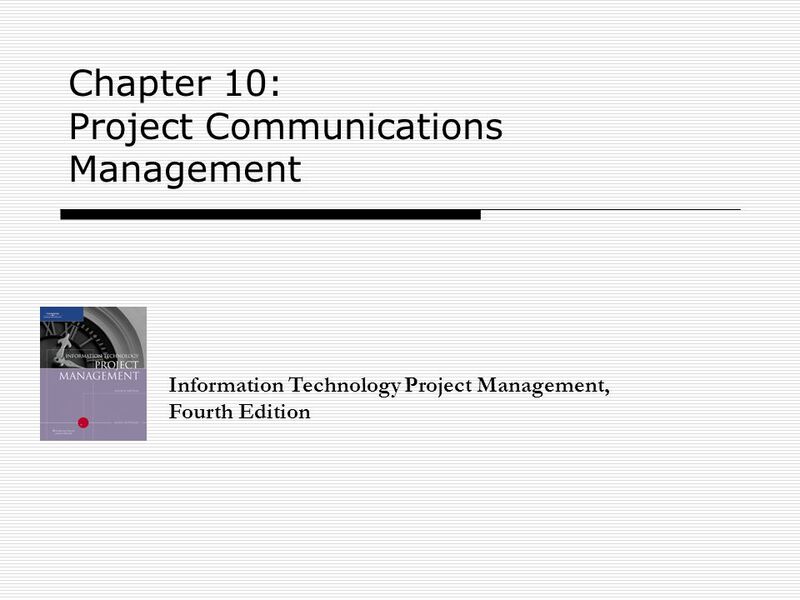 Download ppt "Chapter 10: Project Communications Management Information Technology Project Management, Fourth Edition." 1 Balloting/Handling Negative Votes September 22 nd and 24 th, 2009 ASTM Virtual Training Session Christine DeJong Joe Koury. Task Group Chairman and Technical Contact Responsibilities ASTM International Officers Training Workshop September 2012 Scott Orthey and Steve Mawn 1. 1 Meetings!. 2 Introduction Professional communications Professional communications One-on-one One-on-one Phone Phone Memoranda and letters. 1 Click here to End Presentation Software: Installation and Updates Internet Download CD release NACIS Updates. Chapter 8 Copyright © 2014 Pearson Education, Inc.Chapter Writing Negative Messages. 1 CONFLICT RESOLUTION Raising the level of understanding and acceptance regarding zoning issues among residents. 15. 1)List and briefly describe the three project quality management processes. Quality Planning: Identify which quality standards are relevant to project. Show Me the Money! How to ask for a Raise!. 1 Project Communications Management Lecture 11. Learning Objectives Describe the importance of good communication on projects and major components of.